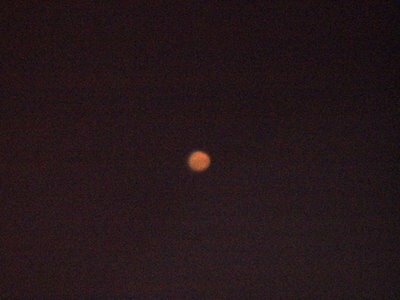 This is Venus two nights ago. It's about 40% illuminated these days, and every day that passes it gets slimmer and taller. This was not the first crescent Venus I've seen, but the first I've seen in a telescope, or photographed at all. I got to show it to a whole party of people who came to the roof in the cold; the telescope was a hit as usual. This is Mars a few minutes later. Like Venus, it was photographed at a magnification of 90x. It's actually almost 99% illuminated, since it's at opposition. I'd hoped to get a photo that showed off some surface features, and there are only a few more days before Mars starts to fade and shrink noticeably. I did see some faint brown splotches across the top half of the disk -- which in this visually corrected photo means the bottom half. They were the first I'd ever seen. In the next few days I will try to get a photograph at 180x. Spectacular. Who needs dark skies when you can see this kind of thing from city rooftops? Wow...I was always fascinated by planets and galaxies as a kid. I had a picture book of planets and was shocked when, after a show-and-tell of the book in first grade, more kids weren't as awestruck as I. The only up close view I have gotten is a dinky hand held telescope courtesy of my uncle that I would use to oggle the moon.